Gerhard Baecker, schooled in Wolfsburg, Germany, now teaches Volkswagen in the United States. 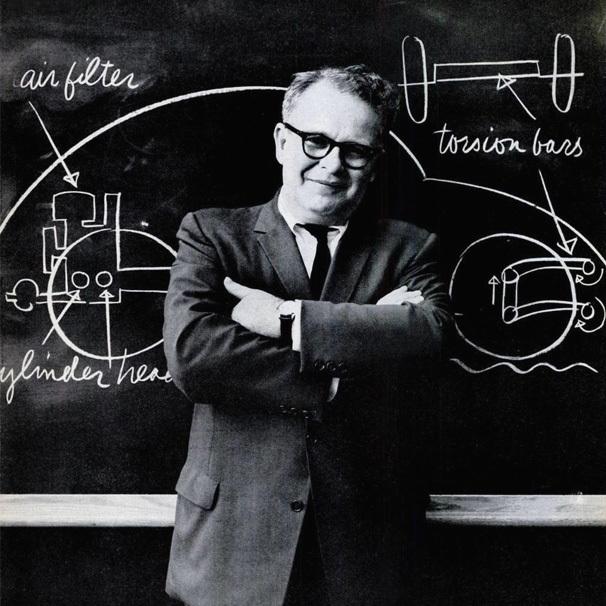 Like most teachers, Gerhard be-lieves in what he teaches. He shares whole-heartedly the Volkswagen philosophy: the car is only as good as the service it gets. iced only by graduate mechanics trained to demanding Volkswagen standards. Volkswagen service is fast. Your Volkswagen engine can be removed and replaced in 90 minutes. 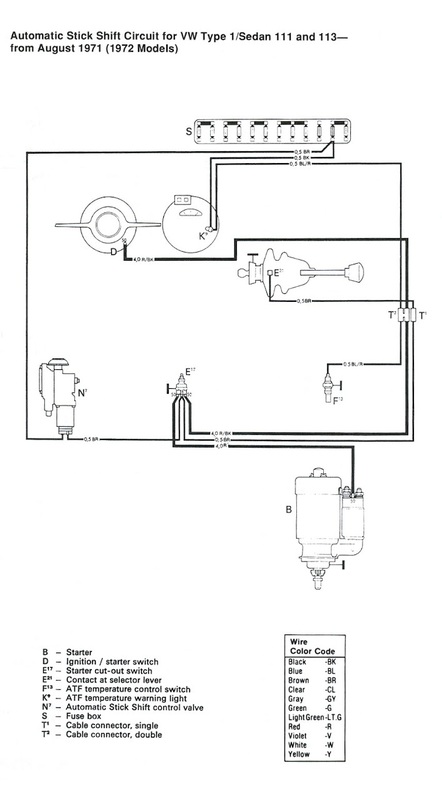 A fuel pump installed in 20. 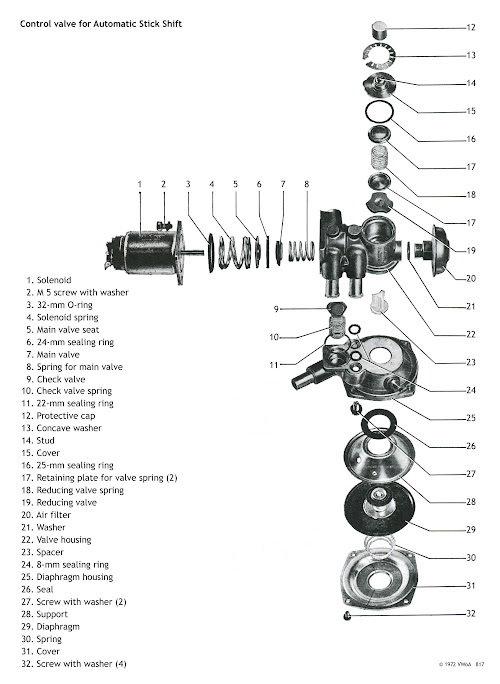 Every authorized Volkswagen dealer has a complete inventory of VW parts on hand. There's no wait, no substitution. If you've been thinking about buying the Volkswagen, isn't it nice to know the service is as good as the car? 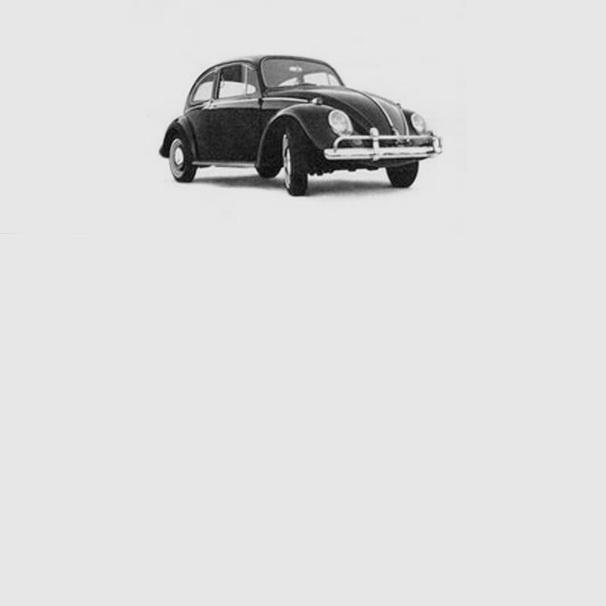 ©1962 VOLKSWAGEN OF AMERICA, INC. 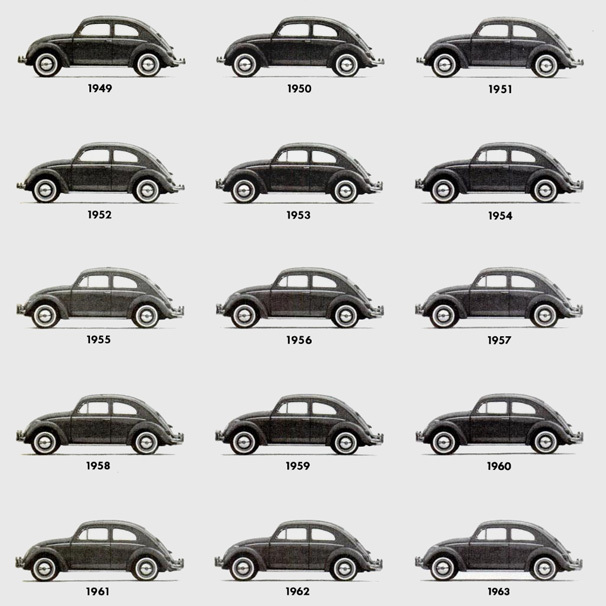 The Volkswagen Theory of Evolution. Can you spot the Volkswagen with the fins? Or the one that's bigger? Or smaller? Or the one with the fancy chrome work? The reason you can't see any revolu-tionary design changes on our cars is simple: there aren't any. the synchromesh first gear? Or the one with the more efficient heater? How about the one with the anti-sway bar? Or the more powerful engine? The reason you can't see most of our evolutionary changes is because we've made them deep down inside the car. And that's our theory: never change the VW for the sake of change, only to make it better. That's what keeps our car ahead of its time. And never out of style. Even if you aren't driving the most evolved VW of all. 1961 VW Ad - No point showing the '62 Volkswagen. It still looks the same. *SUGGESTED RETAIL PRICE, EAST COAST P.O.E. ©1961 VOLKSWAGEN OF AMERICA, INC.
No point showing the '62 Volkswagen. It still looks the same. No heads will turn when you drive a '62 Volkswagen home. The '62 VW runs more quietly. 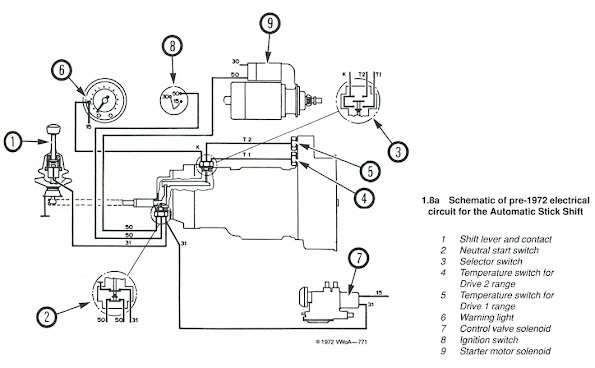 There are new clutch and brake cables (as well as new steering parts) that never need maintenance. Heater outlets front and rear for more even heating. Easier braking. One change is literally a gasser. We've added a gas gauge. Our first. A few die-hards may think we've stolen some of the VW's sporting flavor. But the gas gauge may be more useful than you'd imagine. It will not only tell you whether your tank is E or F; it will prove you're driving a '62. It could make 1962 go down in VW history as the year of the big change. snow, where other cars skid, you go. 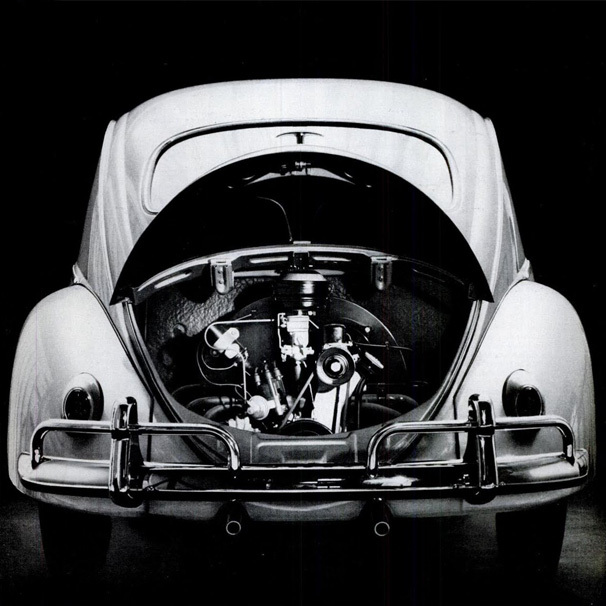 Its location, however, is the least un-usual feature of a Volkswagen engine. For one thing, it is air-cooled, an astonish-ing advantage when you think about it. No water to boil over in the summer, or to freeze in winter. No anti-freeze needed. No radi-ator problems. light and powerful; undoubtedly the toughest 198 lbs. going. It is beautifully machined for minimum friction; you will probably never need oil between changes. And so efficient that top and cruising speeds are the same. Your VW runs at 70 mph all day without strain. You get an honest 32 miles to the gallon (regular gas-regular driving). Don't let the low price scare you off. That's the price of a new Volkswagen. But some people won't buy one. They feel they deserve something costlier. That's the price we pay for the price we charge. And some people are afraid to buy one. They don't see how we can turn out a cheap car without having it turn out cheap. bug's shape every year, we don't have to change the factory every year. What we don't spend on looks, we spend on improvements to make more people buy the car. Mass production cuts costs. And VWs have been produced in a greater mass (over 10 million to date) than any car model in history. too, by eliminating the need for a radiator, water pump, and drive shaft. There are no fancy gadgets run by push buttons. When you buy a VW, you get what you pay for. What you don't get is frills. And you don't pay for what you don't get. © VOLKSWAGEN OF AMERICA, INC. *SUGGESTED RETAIL PRICE, EAST COAST P.O.E., LOCAL TAXES AND OTHER DEALER DELIVERY CHARGES, IF ANY, ADDITIONAL. WHITEWALLS OPTIONAL AT EXTRA COST. ike most vintage Porsche owners, I found myself dealing with a faulty ignition switch. For the last year or so, intermittently it had not been working, then intermittently it worked, and finally it became a bit of a lottery. All key positions were functioning except the last click - engine start. 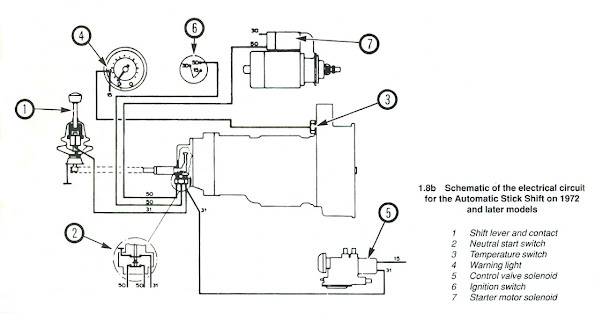 My first challenge was to remove the two shear bolts (#5 in diagram). A shear bolt is a type of security fastener with a head that breaks away after tightening to prevent easy/criminal removal. After some careful drilling and using a Mastercraft GraBit I managed to back out the bolts without needing to remove the steering wheel. With a glowing sense of accomplishment I installed the new switch... and had the same problem. With a now deflated sense of accomplishment, I deciding it would be wise to actually diagnose the problem. First I checked all ground straps and battery terminals. 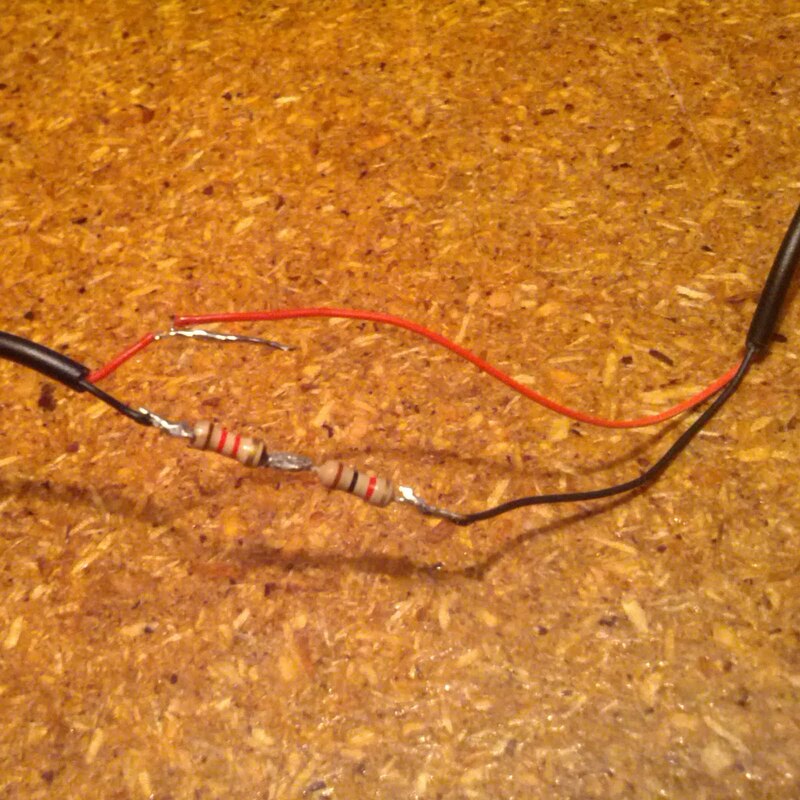 Then I decided to test for power at the solenoid. 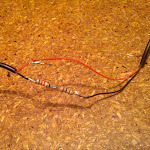 The main line showed a strong 12.4V but the other two wires were flat when the key was turned to the start position - so I knew it likely wasn't my starter/solenoid. I then tested the electrical portion of the ignition switch separate from the mechanical portion (what I should have done to begin with) by turning it with a Phillips screwdriver... Eureka! the engine roared to life. I now knew it was the mechanical portion (#1 in diagram) that was faulty. Looking closely at it, I noticed it wasn't turning quite far enough, maybe 15° short of the full start position. After several days of driving with the electrical switch swinging by my knees and a Phillips stubby in the ash tray, I figured I either need to dish out the $600-700 for a new ignition switch or try to repair the one I had. If I were to buy a new one I'd need to open it up to rekey it, so I decided to disassemble the old one as practice with hopes of maybe finding an easy fix. 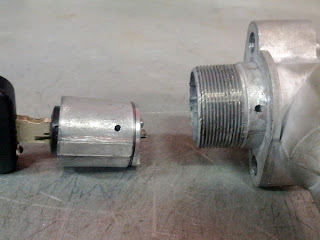 To release the key barrel/tumbler, I used a 1/64" bit to drill out the single pin. With the barrel out I could see it was showing some age and was a bit sloppy. At the tail-end of the tumbler there are two plates that turn with the key - the thicker outer one turns with the key and the thinner, inner one turns a bit out of sequence. Mine were turning at the same time. In a functioning mechanism, when turned clockwise, a spring-loaded pin clicks into a hole and turns the inner plate. Then when turned counterclockwise, the pin pops into a notch on the outer disk, preventing it from being turned clockwise again until turned all the way back. This "start lockout" prevents the car from being restarted after it's already been started. Without taking the tumbler apart, I tightened things up significantly by hitting the two pins at the back with a hammer and punch. 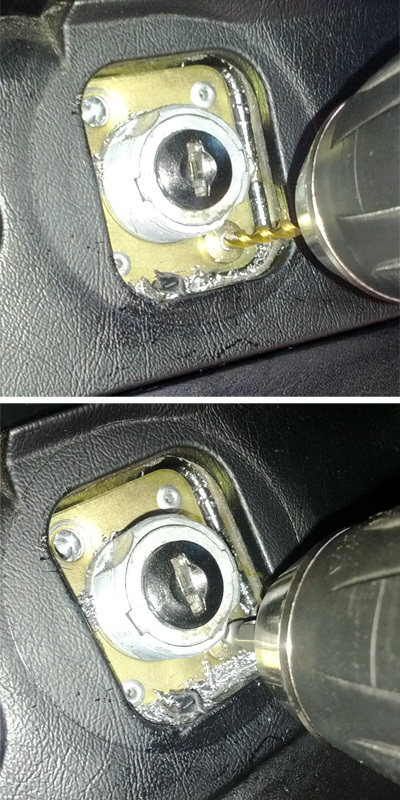 To save the next guy (or future me) some trouble, I tapped the pin hole and replaced the pin with a cone point set screw. 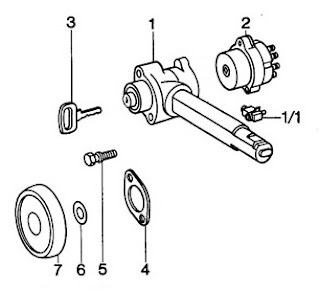 Also, when installing the ignition back in the car I used regular bolts instead of the OEM shear bolts. 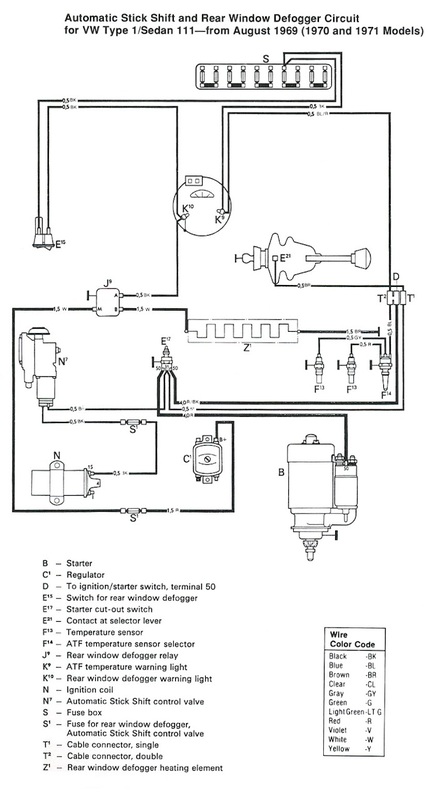 Here are a few more autostick electrical diagrams. Here are a bunch of autostick electrical diagrams. 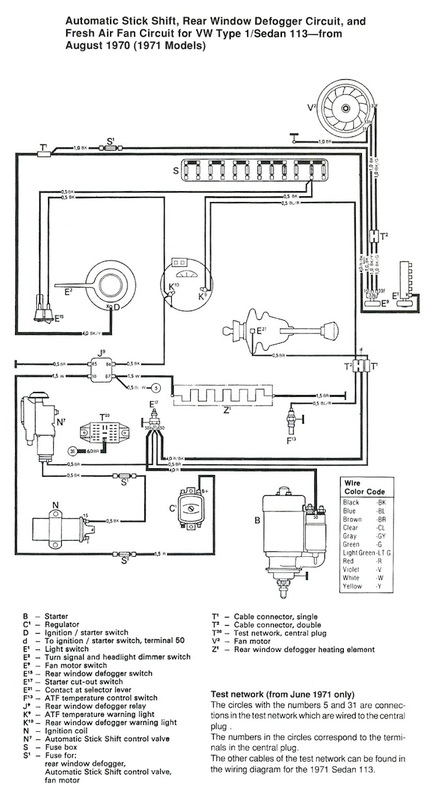 Here are a couple handy diagrams from Volkswagen of America.